Clean and adaptive grid-based layout for artist, fashion blogger and photographer. A classic theme with a timeless look. Demi is clean and adaptive grid-based layout for artist, fashion blogger and photographer. 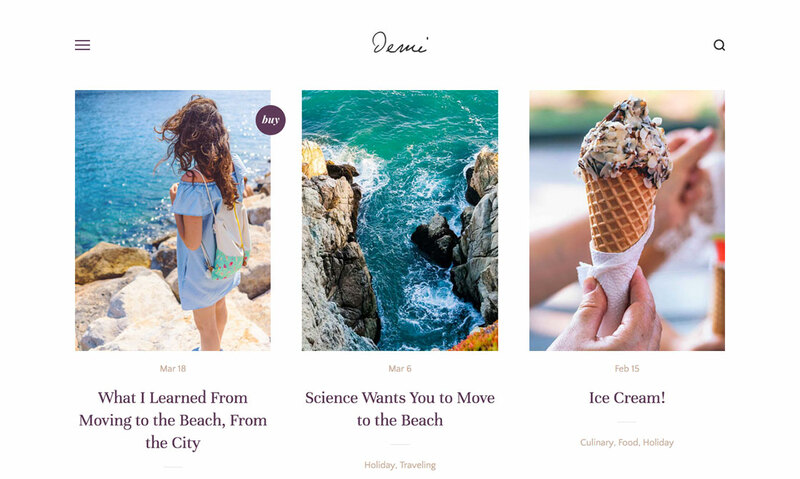 With “buy button” support, Demi helps you blog and sell stuffs —or promote your products— in a way that’s engaging, letting visitors enjoy your articles in a great way. Demi is entirely responsive, means your content will scale to fit any screen size, from desktops to mobile phones. Easily tailor the accent and overlay colours of your site in the Theme Designer. Truly effortless customization. Demi has Buy Button built-in, allowing you to showcase your products sold on Etsy, Amazon, or direct transaction with PayPal. Graphics are presented at higher quality, resulting in sharper images and icons even on high-resolution display. Extensive documentation is included to help you get your theme up and running in no time. Demi is based on the v3 framework with show/hide widget capability and new comment form UI. People are more likely to tweet quotation. With Tweet button attached on it, making sharing more convenient. Backgrounds and scripts used to create Demi are included in a separate folder. Making backup easier. This package grants you access to our entire collection of themes for one low price. That's about 85% off. Buy theme individually to be used on personal or commercial project. Heybi is based in Makassar, Indonesia. We focus on making awesome Blogger themes that wow people. Get updates on Heybi progress. No spam, ever.